Kendall Coyne was always the young one. For the inaugural IIHF Women’s Under-18 World Championship in 2008, the then 15-year-old Coyne was the youngest player on the team. A year and a half later at the 2009 USA Hockey Women’s National Festival leading up to the 2010 Olympic Winter Games, Coyne, then 17, was once again the youngest player invited to the tryout camp. That is a distinction she will shed this go-around. There are six players on the 25-player preliminary Women’s Team roster younger than Coyne. 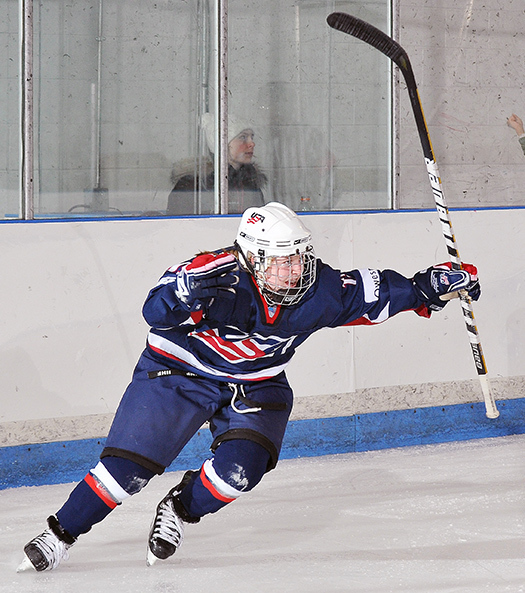 USA Hockey History: Played for the U.S. Women’s Under-18 National Team from 2008-2010. A member of the U.S. Women’s National Team at three IIHF Women’s World Championships (2011-13). Played in the Four Nations Cup in 2010 and 2011. Participated in the 2009 Women’s National Festival. While she is still one of the younger players on the team, she brings a wealth of international experience. She has skated in 63 games for Team USA, and was a part of the aforementioned tryout camp for the 2010 Olympic Winter Games. That experience in 2009 helped her prepare for the selection camp this time around in Lake Placid, N.Y. When she was younger, Coyne would head to the local rink in her hometown of Palos Heights, Ill., to watch her older brother play hockey. She got started on the ice when she was three. However, hockey skates weren’t the first things to touch the ice. “My parents put me in figure skates. That lasted about a week,” she said. Coyne said she wanted to play hockey because she wanted to be more like her brother, who is three years older than her. The rest, as they say, is history. With no all-girls’ teams in her area, Coyne grew up playing on boys’ teams. She didn’t think anything of it, although she said she was never as good as them, which made her strive to get better. Coyne got a chance to compete against other girls at the 2008 U-18 World Championship, where she posted six points in five games, including the overtime winner in the gold-medal game against Canada. Her path eventually took her to Northeastern University in Boston, where she enrolled for the 2011-12 campaign. Two seasons, 65 games and 113 points later, Coyne finds herself on the verge of representing her country at the highest level. She credits her experiences with college hockey for helping her grow as a player. However, that college career will be on hold as Coyne joins the women’s residency program just down the street from the Northeastern campus. While she is excited for the opportunity to play with and against the world’s best, she already misses her college teammates. Spoken like a player who is wise beyond her years.